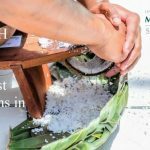 Hundreds of children and parents participated in educational activities and demonstrations. 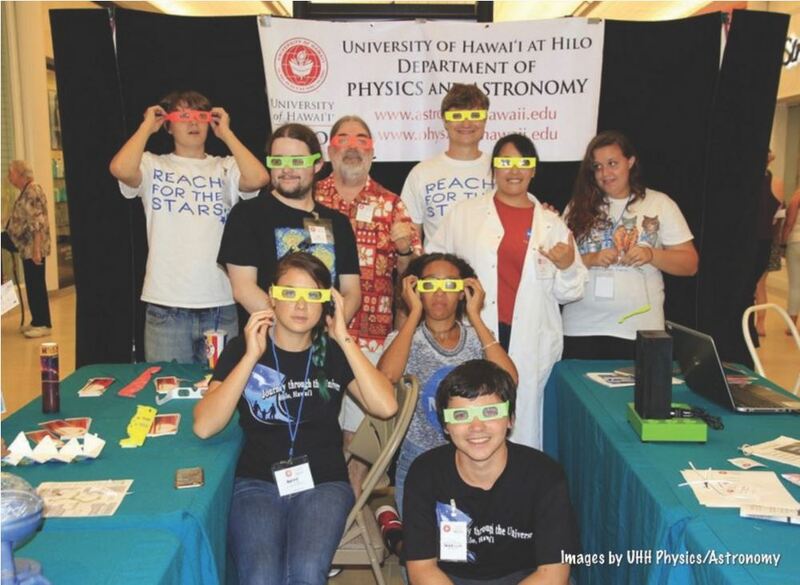 Among 200 volunteers running booths were students and faculty from UH Hilo astronomy and pharmacy programs. 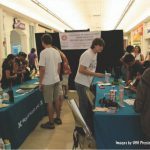 The UH Hilo physics and astronomy department had a blast showing keiki all the “toys” of the trade at this year’s AstroDay on April 30 at Prince Kuhio Mall. 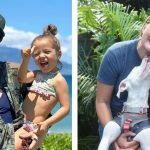 Click photos to enlarge. 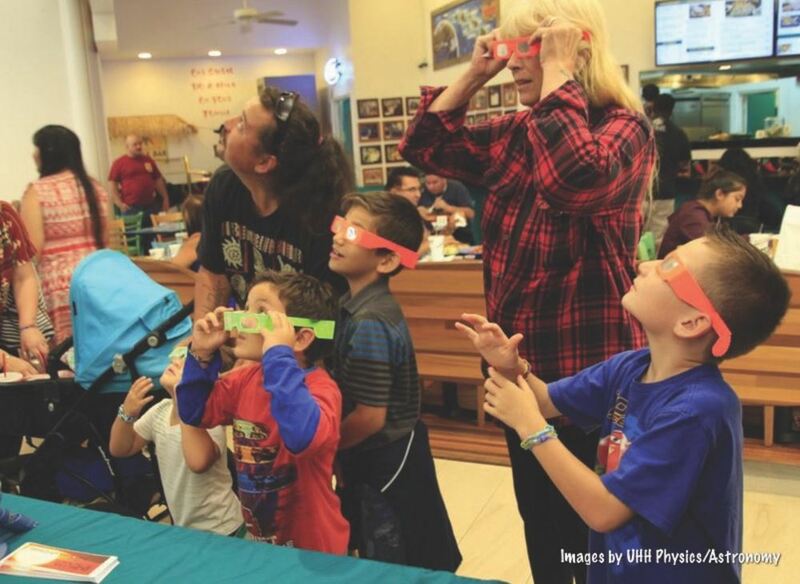 Astronomy professor Kathy Cooksey demonstrates a computerized telescope. 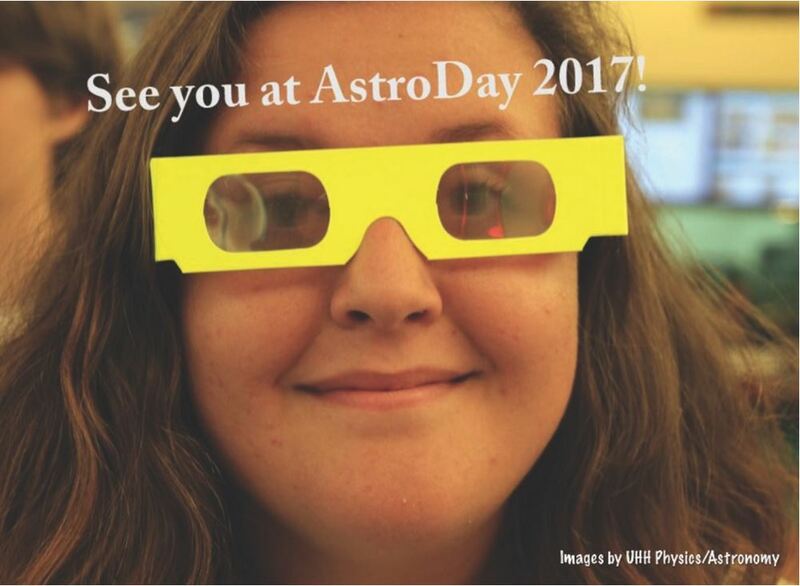 Astrobiologist student Nicolette Thomas tends a display table at AstroDay. 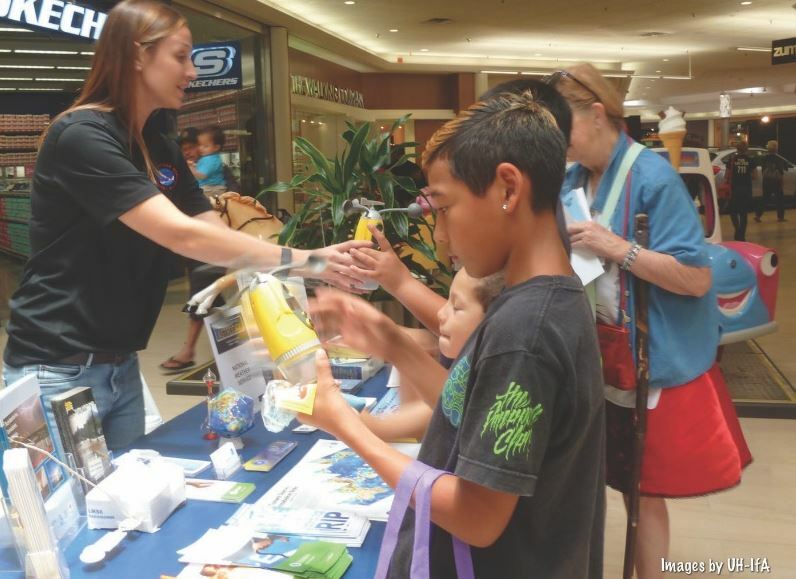 On April 30, Prince Kuhio Mall bustled with hundreds of children and their parents eager to participate in educational activities and demonstrations at this year’s AstroDay. 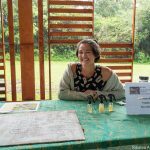 Over 200 volunteers represented 38 different organizations from observatories to local schools, clubs, and community groups. 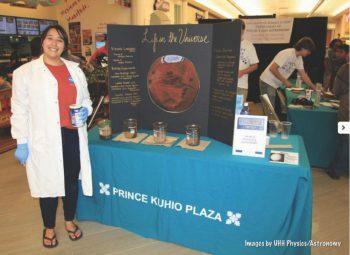 Among the volunteers were students and faculty from the University of Hawai‘i at Hilo astronomy and pharmacy programs (astronomy student featured in video below). 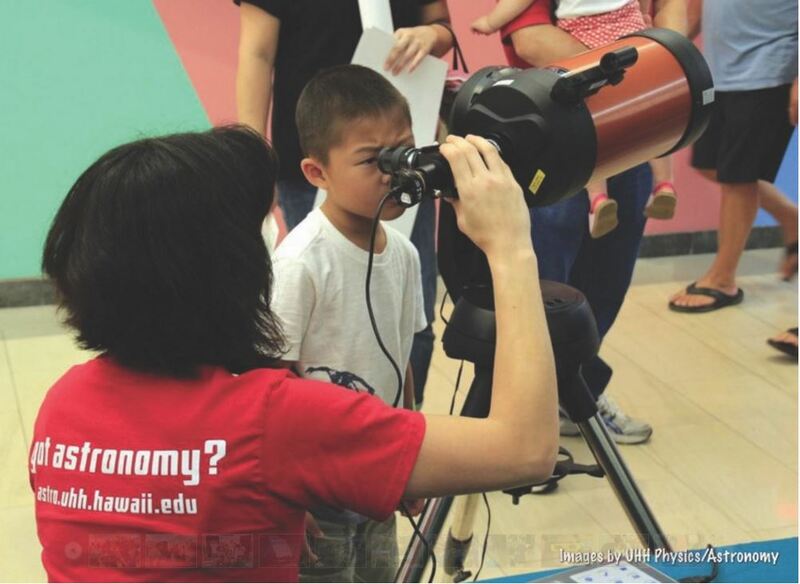 AstroDay is sponsored annually by the Maunakea Astronomy Outreach Committee. 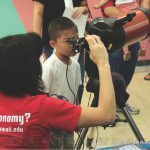 The group’s mission is to do educational outreach on behalf of the Hawai‘i Island astronomy community. Kimo Pihana opened the ceremonies with a pule (chant). The event was hosted by deejay DC and Mike Evans from KWXX/B97. Sen. Kai Kahele and Rep. Clift Tsuji voiced their support of the event with opening remarks. 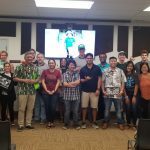 Entertainment was provided by the Lorilei Halau, Christy Lassiter & Friends, Ben Kaili, and the Puna Ukulele Kanikapila Association. 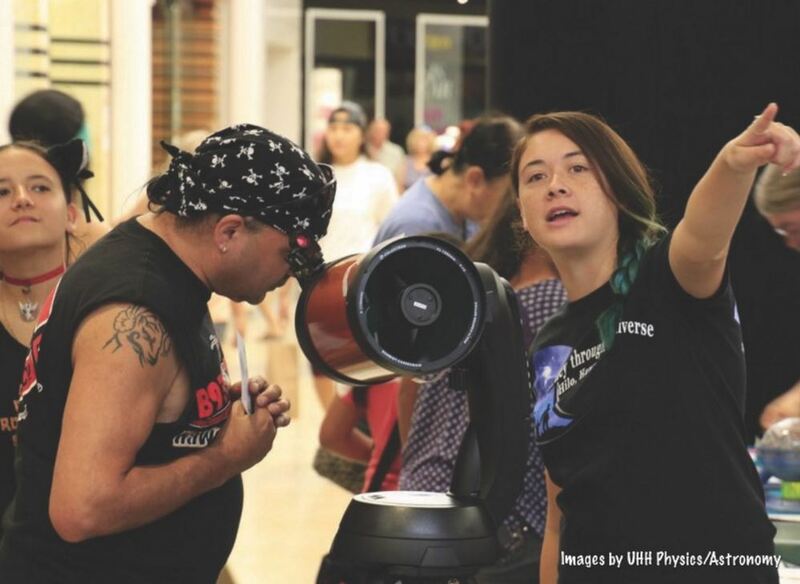 Future scientist gets some important info about Killer Asteroid Hunters. Click to enlarge. 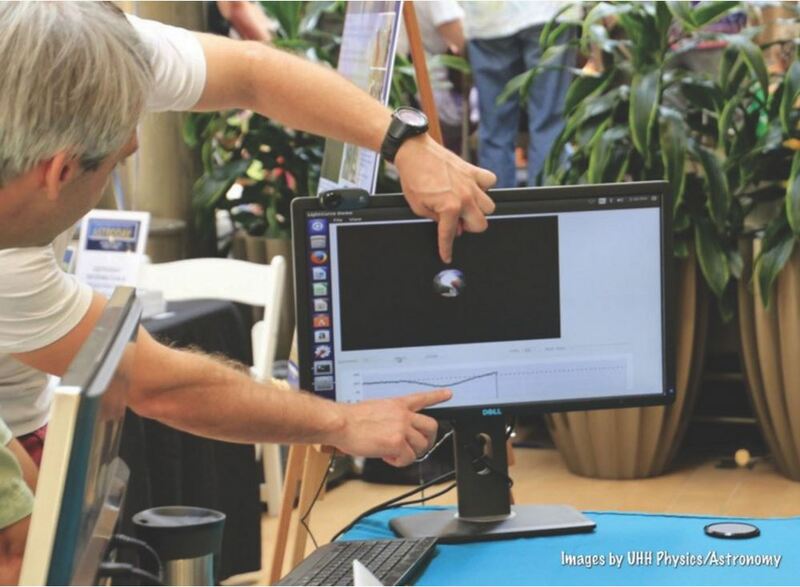 There were booths for the observatories from Maui and Mauna Loa, filled with information about hunting “killer asteroids” and monitoring severe weather and solar outbursts. 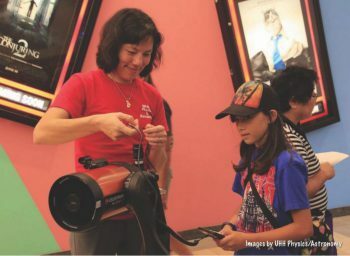 IfA’s 2.2-Meter Telescope donated a new Celestron 4 Computerized Telescope for a prize drawing for students grades 6-10. 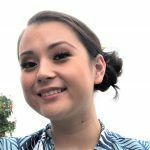 Sarah Fukumura-Sawada, a 6th grader from Waiakea Intermediate School, was the lucky recipient. 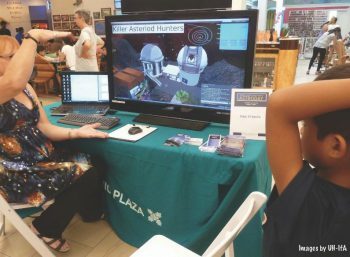 Sarah attended AstroDay as an invited Science Fair award winner; she was one of 19 Science Fair students from Hawai‘i Island who displayed and explained their projects to the public throughout the day. 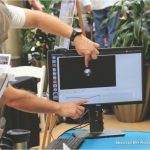 Solar viewing was hosted by IfA staff throughout the day’s celebrations. Future astronaut tries on helmet from the movie The Martian. 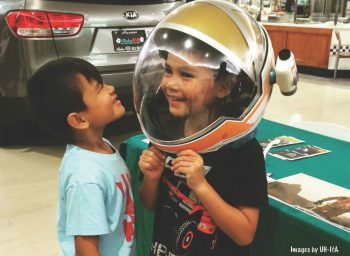 Space and technology highlights at AstroDay included programs in Starlab, a portable planetarium provided by Gemini Observatory; a planetary rover from the Pacific International Space Center for Exploration Systems (PISCES); robotics from Kea‘au, Hilo High and St. Joseph schools; a helmet from the movie The Martian; and ways of searching for extrasolar planets. Other science related programs were offered by Hawai‘i Electric Light, the National Oceanic and Atmospheric Administration, Pacific Tsunami Museum, The Center for Active Volcanoes, and the UH Hilo College of Pharmacy. Students from UH Hilo’s College of Pharmacy had an interactive booth at AstoDay. 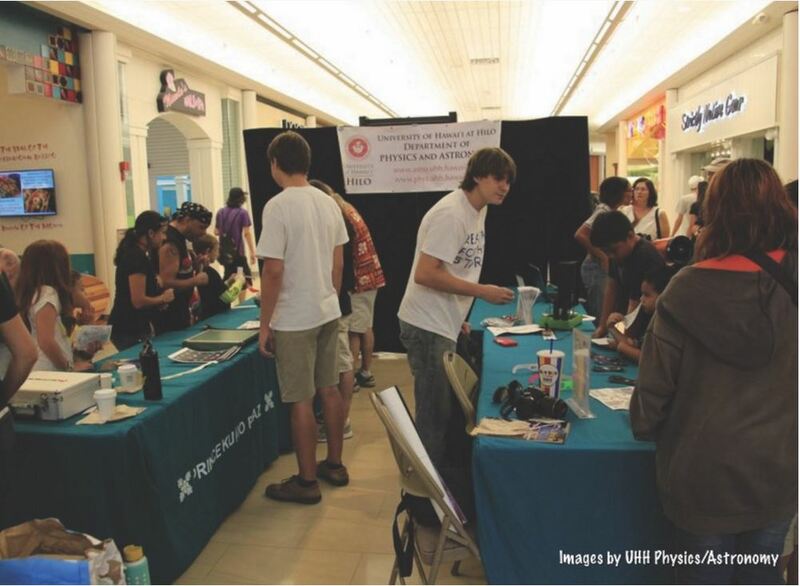 The students are members of the National Community Pharmacists Association (NCPA) Hawai‘i Student Chapter. 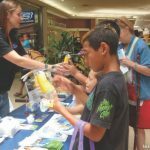 Their goal was to promote the profession of pharmacy to children of the community through a fun hands-on activity called “Compounding for Kids,” where the pharmacy students demonstrated the compounding of silly putty and ice cream. 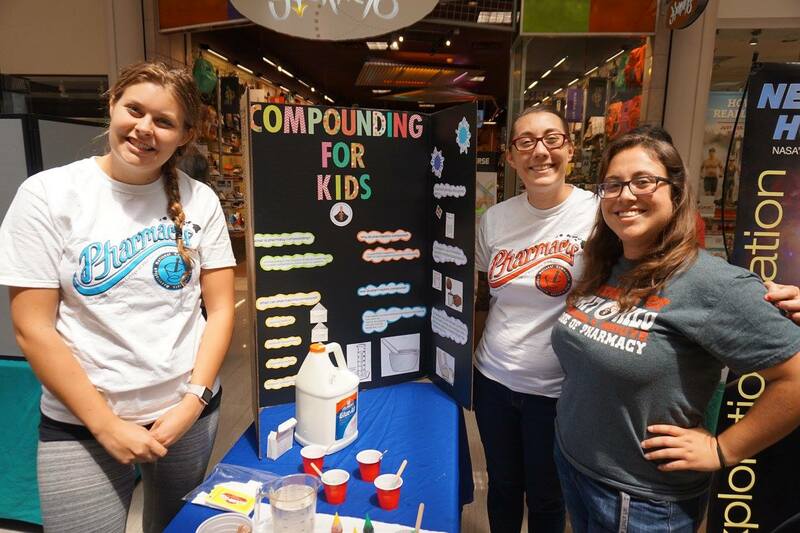 Pharmacy students (l-r) Karen Christian, Athena Borhauer and Stephanie Ramirez at their AstroDay table, where they assisted school children in compounding silly putty. Courtesy photos, click to enlarge. 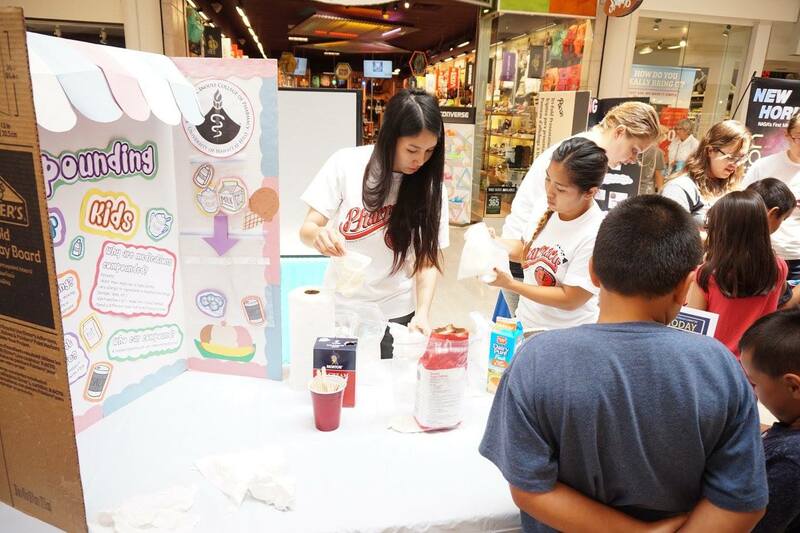 UH Hilo pharmacy students (l-r) Kaylee Hoang and Theresa Thu Nguyen at AstroDay, where they engaged school children in an ice cream making activity. 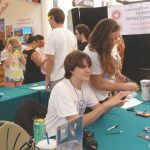 Another component of AstroDay is the annual Maunakea Coin Contest. 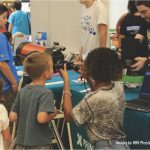 The contest was created to enhance the awareness of the convergence between astronomy and the Hawaiian culture of Maunakea, and is open to all K-12 students on Hawai‘i Island. 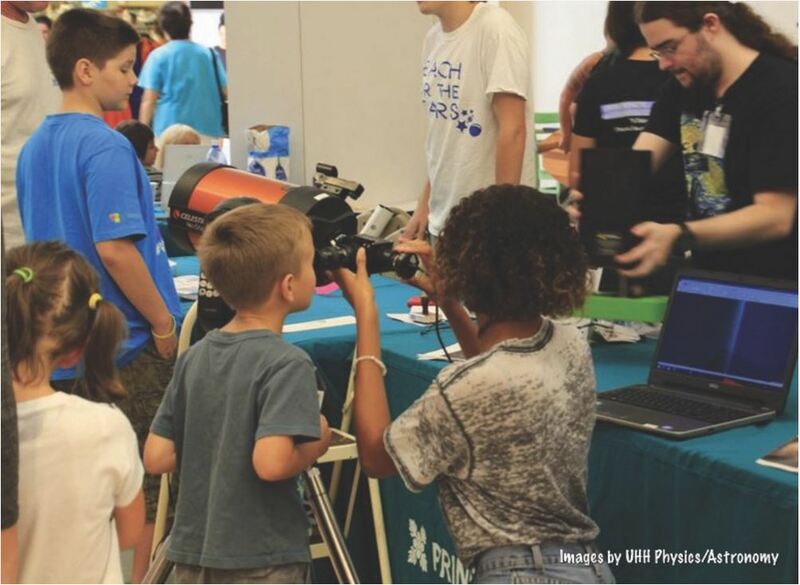 Students compete in making the winning design for the coin and the winner’s design is minted on the official AstroDay coin, which is distributed at the event. The 2016 Maunakea Coin Contest winner is Taya Lampman, a 4th grader at the E.B. de Silva school in Hilo. 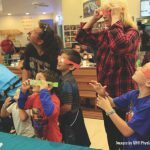 -Article by Carolyn Kaichi, education and outreach specialist at the UH Institute for Astronomy. 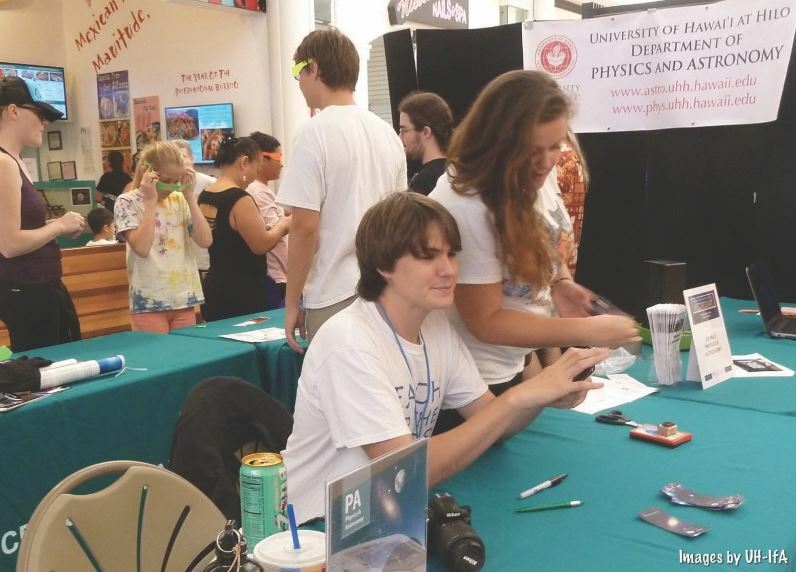 This story was revised on May 18 to include the section about the College of Pharmacy booth. 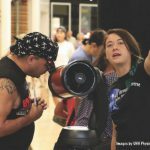 –More photos of 2016 AstroDay.